A double beam self-recording infrared spectrophotometer, using a rock salt prism for infrared light dispersion and a thermocouple for detection, was released in the United States around 1950. The term "self-recording" refers to the automatic logging of the infrared spectrum while the instrument is performing photometry. Simply speaking, it means that the infrared spectrum could be obtained simply by pressing a switch and then waiting. Following its release in the U.S., one instrument after the other was imported to Japan, where they began to be used by major universities, public research institutions, and pharmaceutical and chemical companies. At the same time, research societies and meetings on the subject of infrared spectrometry were inaugurated, leading to an "infrared boom" in Japan. Though Shimadzu also undertook development of its own double beam self-recording infrared spectrophotometer, there were a number of technical issues to be overcome, which prevented us from commercializing it immediately. The technical issues included the facts that we could not manufacture a large, good quality artificial rock salt crystal and that the sensitivity and responsiveness of the thermocouple we manufactured were insufficient for use as a detector in an infrared spectrophotometer. Manufacture of a large, good quality rock salt crystal was eventually accomplished under the guidance of a professor from a university in Kyoto. We unfortunately remained unable to manufacture a good quality thermocouple, despite considerable trial and error. As a result, we abandoned manufacturing a thermocouple, and decided to use an American made thermocouple. Development proceeded, now that the necessary parts were no longer an issue. A rock salt prism is deliquescent, which means that if it is left exposed to the highly humid air in Japan, the polished surface will dissolve, becoming rough in texture, and no longer usable. For this reason, a constant-temperature, low-humidity room was prepared for use in equipment manufacture. 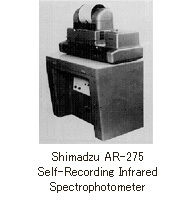 After considerable effort, the AR-275 double beam self-recording infrared spectrophotometer was completed in 1956. The model number "275" came from the focal length of the collimator mirror in the monochromator. The 3 units were completed and delivered, but the resolution of all 3 units was not as good as that of a prototype. When the cause was investigated, it was found that the problem was with the thermocouple. The thermocouple had a vacuum light-sensitive surface, and the degree of vacuum was found to have deteriorated. From this bitter lesson, we learned that manufacturing our own thermocouple was essential, and so we began to pursue this line of research again. By devising a vacuum method and a surface treatment method for the light-sensitive surface, we were finally able to complete a high-sensitivity, long-lasting thermocouple. As a result, our product became suitable even for overseas export. 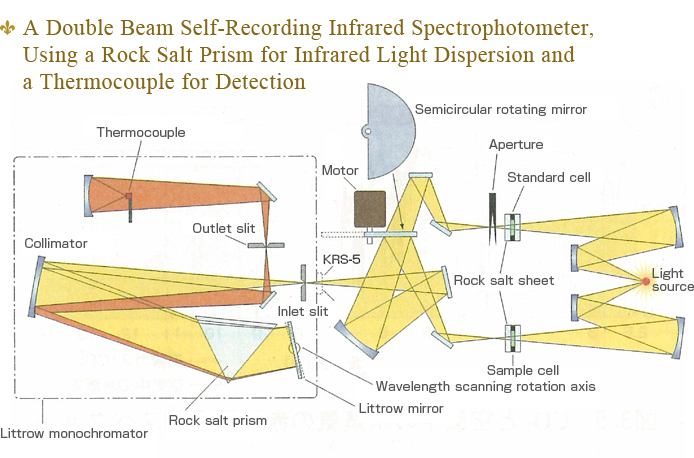 The figure shows the optical system for a double beam self-recording infrared spectrophotometer using a rock salt prism. A nichrome wire for example, which emits heat rays (infrared rays) when heated to a high temperature, is used as the light source. Infrared light from the light source is dispersed into a reference light beam and a sample light beam. After passing through the standard cell and sample cell, the light beams enter the monochromator alternately via a semicircular rotating mirror. The wavelength is selected via the rotation of the rock salt prism and Littrow mirror. The dispersed infrared light is then detected by the thermocouple, where it is converted into an electrical signal. If the sample absorbs infrared light at a certain wavelength, then this results in a difference in intensity between the reference light beam and the sample light beam. The electrical signal corresponding to this difference is applied to a motor, which drives the aperture at the reference light beam side, which dims the reference light beam. When its intensity becomes equivalent to that of the sample light beam, the motion of the aperture stops. The infrared spectrum is then obtained by logging the motion of the aperture. This method of obtaining the infrared spectrum by using an aperture is referred to as the optical null method. It has been used for a long period for double beam self-recording infrared spectrophotometers. The globar light source is used in infrared spectrophotometers. It contains a silicon carbide rod (section 2 in the photograph), which emits infrared light when heated. Deliquescence refers to the dissolving of a crystal though the intake of moisture from the air. Deliquescent materials include sodium chloride, potassium bromide, magnesium chloride, etc. 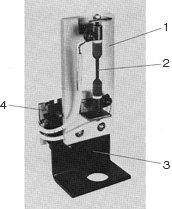 In the figure captioned "Optical System for a Double Beam Self-Recording Infrared Spectrophotometer Using a Rock Salt Prism," this mirror receives the light beam condensed at the slit position, and turns it into a parallel beam. Conversely, it is also used to condense a parallel beam to a single point. It is also referred to as a parabolic mirror.